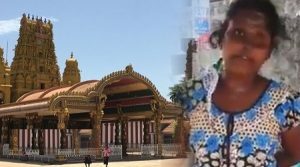 Jaffna News: Jaffna It is reported that a woman who has been repulsed in Nallur is being threatened by a man. The Nallur Kanthan temple festival is being held and the places for setting up shop in the temple premises are provided. The woman has been given the opportunity to give priority to the remunerative and widows. The girl also pointed out that the person will threaten to see how you get to shop during the festival next year. Social activists say they are faced with mental illness because of the disadvantages of disabilities.